30 Second Wine Advisor: Why take tasting notes?  Barrel Room Blowout at The California Wine Club! Save up to 70 percent off normal retail prices during The California Wine Club's last Wine Sale of the year.  Why take tasting notes? If you're into wine for more than just something good to drink, then keeping a tasting notes log is a great way to help fine-tune your palate. A traditional blend from Northeastern Italy's Alps, this full-bodied white is fruit-forward but balanced and structured, no mere "fruit bomb." Psst! Want to learn a wine-tasting secret from the pros? This advice is simple and easy to follow, and you don't need to dial an 800 number or pay a cent to hear it: Simply get into the habit of jotting down a quick summary of your observations whenever you enjoy a glass of wine. Don't get nervous ... I'm not talking about anything really complicated. There's no need to worry about neat handwriting or even careful spelling or grammar. There's no required format, and you don't even have to show your notes to anyone (although I'll say more about that in just a moment). All you have to do is get your hands on a legal tablet or steno pad - or, if it pleases you, a fancy journal or one of those trendy Moleskine notebooks with the leather-look cover - and when you taste wine, record your reactions. I suggest starting with the front and back label: Write down the name of the wine, where it's from, the vintage, and other information such as the grapes it's made from (if disclosed), the alcohol content and anything else that seems important. I like to add the price I paid and the shop I bought it from. On the other hand, lyrical back-label language from the winery's PR office can usually safely be ignored. Then jot down your comments on the wine, step-by-step as you go through the tasting process: Observations about the color, hue, glints of light; is it cloudy or hazy, clear or transparent? Then the aromas, using whatever descriptions pop into your head. Your first impression is usually the best impression, even if it seems silly. (My wife is a master at discovering notes of "shampoo" or "modeling clay" or "silage in my father's dairy barn.") And she's usually right. Carry on with your observations about the taste of the wine - flavor, texture, body, heat - and its aftertaste or finish. Then at the end, add any final thoughts about your overall impressions of the wine and, if you like, a rating, whether it's your best guess on a 100-point scale or a school report-card grade of A, B, C, D or F. Or just a verbal "love it," "hate it" or "not sure what I think about it." Keep the notebook handy in case you have any afterthoughts (or to record the wine opening up or changing in the glass), and then, when the evening is past, close the book, returning to the next page another day. What's the advantage in this? Even if you keep your notes as tightly confidential as Juliet's diary and never show them to anyone, by taking a record you're cementing the details in your memory. And just about every wine professional I know would agree that a strong tasting memory is one of the keys to training a good palate. The more you can remember about previous wines, the more effectively you can gauge each new wine you taste. It's also just plain fun to go back and browse through your old notes, and I think you'll find that reading your quickly jotted impressions of a wine long past is a surprisingly effective way to bring back detailed visual (and smell and taste) memories of happy past occasions. Moreover, it can be very interesting indeed to go back and look up your notes on a wine when you're tasting a later vintage from the same producer a few years later. 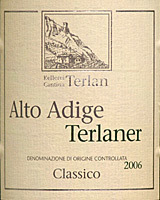 This process, indeed, inspired today's tasting, when I pulled the cork on an interesting Northeastern Italian white, Terlan 2006 Alto Adige Terlaner Classico (featured below), and compared them to my notes on the same wine in its 2001 vintage, tasted in 2003. The label hadn't changed, but quite a bit else had: The wine had shifted from a blend of Sauvignon Blanc, Pinot Bianco and Riesling Italico (Welschriesling) to Pinot Bianco, Chardonnay and Sauvignon Blanc. Its style had shifted, too, from earthy and mineral-driven to a much more full-bodied, fruit-forward quaff. And I couldn't help noticing that four years had kicked up the price from $10.99 to $19.99, a price-tag inflation that significantly exceeded the rise of the Euro against the dollar. Go figure. I didn't absolutely need any of this information, but I thought it was mighty interesting to have it. I think you will, too. If you aren't already taking wine notes, get a notebook and give it a try! Finally, although I told you that you can keep your notes private, I'd like to take a moment to encourage you to consider sharing them with wine-loving friends, and we try to make it particularly easy to do so on our WineLovers Discussion Group online forum, where we make it a rule to encourage folks to taste, share impressions and learn in a supportive online environment. Dive on in! The water is just right, and the natives are friendly. Barrel Room Blowout at The California Wine Club! Save up to 70 percent off normal retail prices during The California Wine Club's last Wine Sale of the year. Visit www.cawineclub.com to view a full list of the wines or call 1-800-777-4443. Choose from more than 100 award-winning, limited-production wines ... all on sale at prices well below normal retail. Half, full and mixed cases are okay. All prices FOB Camarillo, Calif.
Shop, save and stock up for the holidays! FOOD MATCH: The back label suggests enjoying it as an aperitif or "with greens and fish dishes." It served well with a big summer salad of crisp lettuce, sweet onions and fresh tomatoes, turned into light summer evening meal with garnishes of crisp bacon and sharp Cheddar. VALUE: A balanced and appealing white wine, excellent with food, it can justify a $20 price point against the competition. Still, I can't help noticing that the 2001 vintage sold locally in 2003 for $10.99, just over half that price. The Euro has become stronger, but not that much! WHEN TO DRINK: Balance and structure hint at some ageworthiness for a white, but freshness and fruit argue for drinking it up while it's young. I'd vote "drink soon," but wouldn't oppose losing a bottle or two in the cellar for the sake of science.